Modest Mama: Product Review: AIMS Earth Rocks! AIMS Educational Foundation strives to create science and math activities designed to engage and deepen your students understanding through hands-on learning experiences. As a non-profit organization, AIMS promises to provide affordable, engaging, and easy to use programs of the highest standards. There are many different titles offered by AIMS. Topics range from space to earth exploration as well as a wide-range titles pertaining to mathematics. The books cover the entire range of elementary-aged levels, and many appear to be adaptable to older or more advanced learners. I received the Earth Rocks! text for review. Designed for grades 4-5, this text retails for $29.95 on the website. 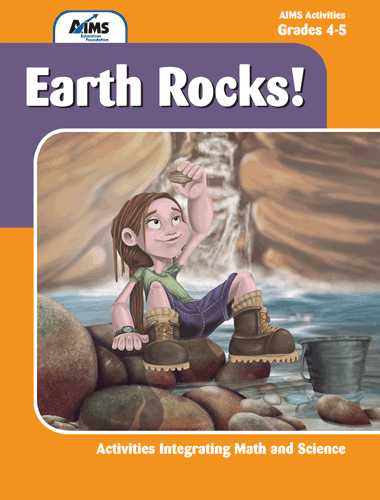 The book is divided up into seven concept areas: rocks & minerals, soil, water, Earth changes, resources, and pollution. I liked that so many different topics were explored. In the past when we have studied earth science, the books we have used have saturated us with so much information on one particular topic ( such as types of rocks) that it becomes dull and boring. Another great aspect of the book is how kid-friendly it is. There are mini-books to copy and lab sheets with large spaces to write or draw about the experiment. Many times lab sheets require so much writing that it takes the fun right out of doing an experiment. I have actually had the kids not want to do science because of the extensive writing involved. The sections are separate from each other and so you can jump right in and get started learning in a topic area of current interest. This was great at my house because sometimes a curriculum requires you complete activities in order, and if the kids aren't engaged or interested then it is like pulling teeth to get them through it and to a part that they'll enjoy. My only problem with the text was obtaining some of the materials necessary for the labs. This may be a geographic problem, since living in a rural area limits us in our selection of stores. The book does offer a nice Supply List in the back with all the materials you will need for the entire course. It also states the item numbers of items that can be ordered from the AIMS website. Talk about easy! I would say a rough estimate of ordering this course and obtaining all the materials needs to complete it would be between $100 and $150, book included. Completely reasonable for a year-long science course. I enjoyed learning about renewable and non-renewable resources because I didn't know what those were before. I also think I would like learning about pollution. 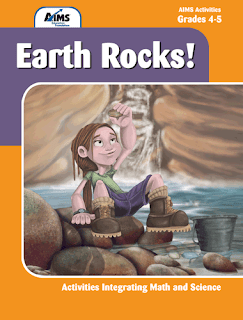 Disclaimer: As a member of the TOS Homeschool﻿ Review Group, I received a free copy of the book Earth Rocks! in exchange for an honest review on this blog. I received no other compensation.